In Berlin last February, Viggo Mortensen was hyped about The World Cup. The Danish-American actor, who was raised in Argentina and currently lives in Madrid (with Catalan actress Ariadna Gil, his co-star in Alatriste and Appaloosa), told journalists that he’d only support Spain if his beloved Argentinian team were knocked out. The 55-year-old actor, who rose to fame as the last minute replacement over Irishman Stuart Townsend in the role of Aragorn in Peter Jackson’s The Lord of the Rings, is a man of the world. In recent years he has leant towards independent filmmaking, notably forming an alliance with David Cronenberg over three films: A History of Violence, Eastern Promises and A Dangerous Method. He carefully chooses the directors he works with. “I like pushing people who themselves put themselves in uncomfortable positions,” he notes. 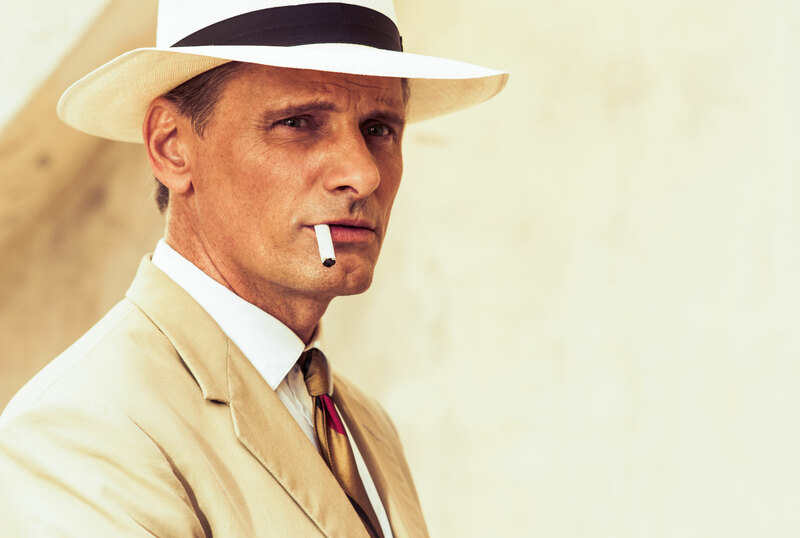 After popular screenings at the Sydney Film Festival, The Two Faces of January is now in Australian cinemas. British-Iranian Amini may have been an experienced screenwriter (Drive, Snow White and the Huntsman, and he was Oscar-nominated for 1997’s The Wings of the Dove), yet he was grateful to have Mortensen’s support while directing his first feature, based on Patricia Highsmith’s little-known 1964 tome. In his screenplay, Amini has, in fact, cleaned up the character. Well, at least initially when we see a dapper Viggo Mortensen in a crisp cream linen suit and his wife Colette (Kirsten Dunst), resplendent in a chic yellow dress, roaming around the Acropolis in Athens. There they meet an American multi-lingual tour guide, the scam artist Rydal (Oscar Isaac), who helps them navigate the ancient city. When Chester gets into trouble with the authorities, Rydal, who is already implicated by this time and also has yearnings for Colette, suggests they all travel to Crete to stay out of the spotlight. The story, like so many of Highsmith’s novels (including The Talented Mr. Ripley and Strangers on a Train which was turned into a movie by Alfred Hitchcock), mostly focuses on the story between the men. Amini says he never would have had the chance to direct without the success of Drive, where he had first met Isaac, the former AFI best actor award winner for Robert Connelly’s 2009 film, Balibo. The actor has gone from strength to strength of late—as the title character of the Coen Brothers’ Inside Llewyn Davis, and the Guatemala-born New Yorker (who can play almost any nationality) is currently filming Star Wars: Episode VII for J.J. Abrams. Amini can see similarities between The Two Faces of January and Drive, which was based on James Sallis’ novel. Published Jun 19, 2014 in SBS. Notes: Article was updated Feb 24, 2015.